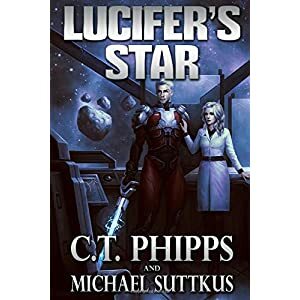 I was going to introduce this review with a comparison to all of the works that Lucifer’s Star reminded me of, but, while there are so many of them, not a single one can be used to give you a good sense of what this book is about. Lucifer’s Star follows Cassius Mass, a former member of a royal house with huge political sway that they use to wage war. The world building in this book was amazing and we see a lot of detailed explanations in the interplanetary relationships as well as the individual cultures, all without taking away from the main story by being too filled with description. The descriptors come out naturally. Cassius is a clone of the sovereign, with cybernetic implants to make him the perfect warrior, the perfect royal heir, and the perfect sexual partner. Each of these lending itself toward complicating his life more and more before finally, as a direct result of the Archduchy’s ongoing war. By the start of chapter 2, we find a down and out, drug and alcohol addled, his face and DNA changed to hide his identity, and living aboard a pirate spaceship with a questionable crew. Then the crew finds out that he’s one of those rich nobles who somehow screwed each one of them over in some different way in the past. From that point, his past begins to come back in a huge way and takes Cassius on a path that makes him question not only who he is, but also everything that he previously held as true. He’s forced to question everything from the difference (culturally) of right and wrong, the idea of identity, what defines a life, the galactic politics, and lots of questions of what love is versus like and versus lust. Like most CT Phipps books, this book focuses a lot on Cassius discovering his identity once he’s been stripped of all the superfluous things that he thought was his identity. He goes through a huge transition from the beginning of the book all the way to the end. When I said this book reminded me of a couple of other stories, it really did, but mostly in just elements. The entire pirate ship and such reminded me a lot of Talon Kardde from the Star Wars Expanded Universe/Legends books. The politics, and how they are so intricately defined, as well as the caste system that’s plainly obvious, reminded me a lot of the Red Rising books. There was even a moment that reminded me of the Borg from Star Trek. A lot of reminders, or ingredients, that made themselves into a great cake. 5 out of 5. Epic Space Fantasy that leaves me begging to learn more about Cassius Mass!